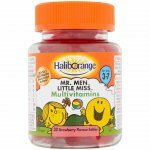 Taking multivitamins has just been made easy. 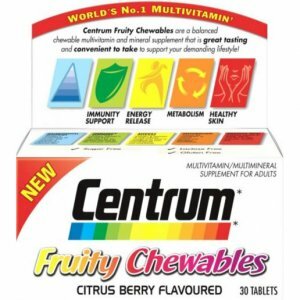 Centrum Fruity Chewables combine the nutritional expertise of Centrum with a delicious citrus berry flavoured chewable format, perfect to take anytime, anywhere. Contribute to a healthy immune system, healthy skin and metabolism. 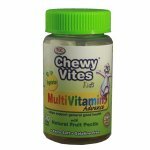 Provides a combination of vitamins and minerals to supplement a balanced diet. 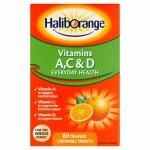 Contains vitamin C, B6 and B12, important for the normal function of the immune system. 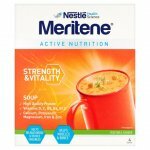 Includes B vitamins to help release energy from food to contribute to your overall health and well-being. 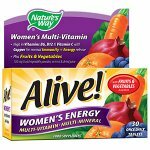 Contains vitamin A, Biotin, Niacin and Zinc to help maintain healthy skin. Suitable for Adults and Children over 11 years. 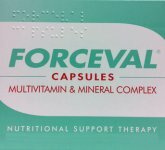 Vitamin A (RE), Vitamin E (α - TE), Vitamin C, Vitamin B1 (Thiamin), Vitamin B2 (Riboflavin), Vitamin B6, Vitamin B12, Vitamin D, Biotin, Folic Acid, Niacin (NE), Pantothenic Acid, Iron, Manganese, Selenium, Zinc.